I knew we wouldn’t be able to get through a football season without the Sandusky scandal screwing with us. So, now here we go. Mike McQueary, famous Showergate eyewitness, has filed suit against Penn State and is asking for millions for the impact that his whistle-blowing will have on the remainder of his life and his ability to produce income. No matter what you might think of McQueary himself, you have to feel that by putting himself in the position he did, his future earnings would be severely impacted. Who would hire him? Where is he going to be getting his income? He’s about the only one involved in the Sandusky caper other than Joe Paterno who doesn’t have a book deal. Victims have book deals. Sandusky is writing another book. Hell, I wouldn’t be surprised to see a couple of trustees announcing books, as as shady and unethical as some of those dudes have been. Who knows what is left of McQueary’s life. Yeah, sure, he’s been spotted around Happy Valley, but how happy is he. Not very, I’d bet. Crap like he’s shoveling usually drags one down with it, creating estrangement from family and community. Mike McQueary is exposed and alone. And I have no problem at all with him asking State to compensate him. The suit seeks $4 million, which is a reasonable approximation of what McQueary’s salary and benefits would have been for 25 years of standing on the sidelines listening to Joe’s ghost yelling at him, or whatever his job might have been. His salary was $140,400, plus some additional bonuses and benefits. McQueary has been on “administrative leave” since November 14. 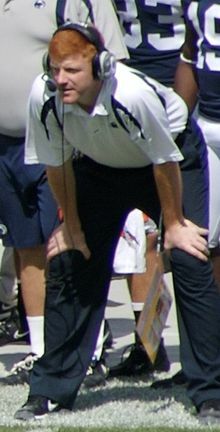 He was the only assistant coach under Paterno who was not given the courtesy of an interview by the new regime. I think McQueary is the quintessential poster boy for whistleblower suits. He’ll almost need a new identity in order to lead some semblance of a normal life henceforth.